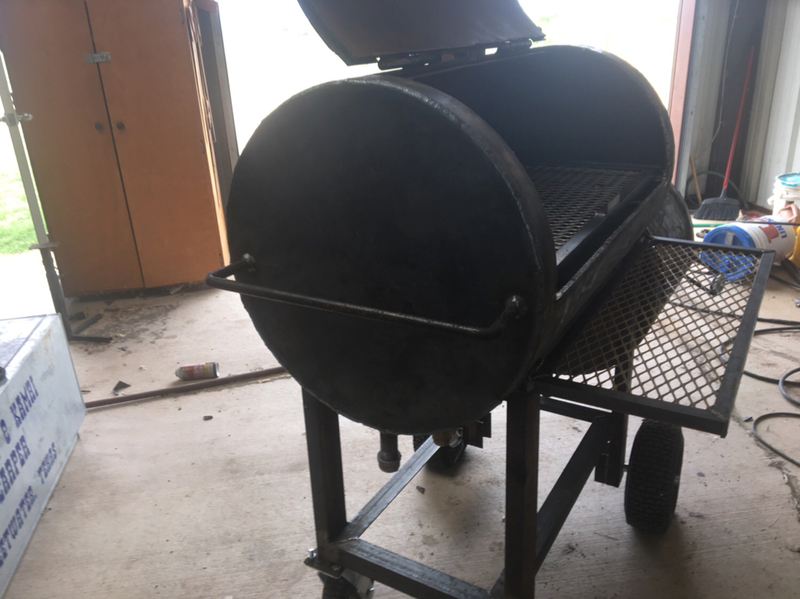 I'm finally starting my Reverse-Flow Smoker Build and I'm going to try to keep this thread updated. I've gotten most of the supplies in, just waiting on wheels, hinges, and a thermometer. 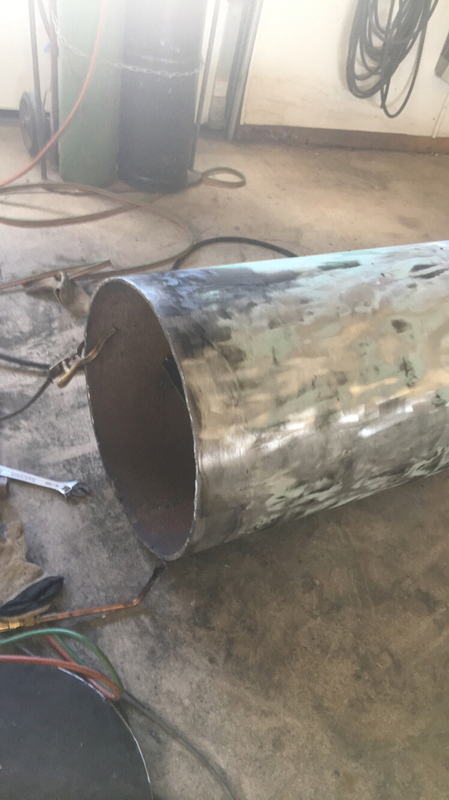 I'm using 24" pipe with a 1/2" wall. This stuff is HEAVY. 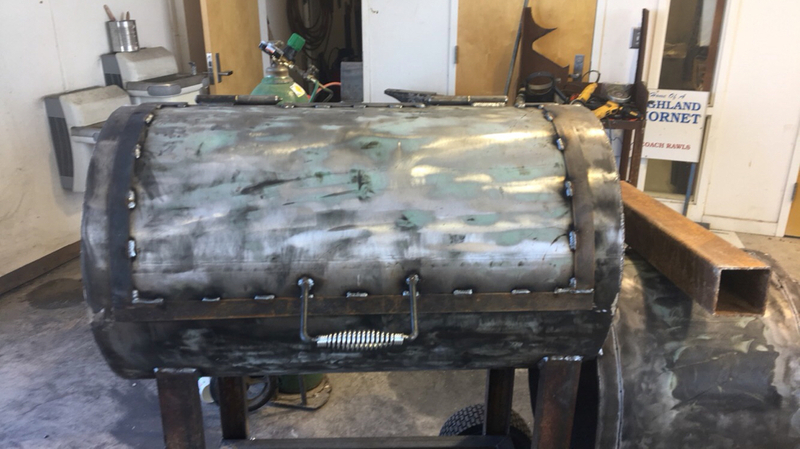 The Firebox is going to be 20" long and the cooking chamber will be about 40". Do any of the Green Screen Smoker Experts have any tips for me? 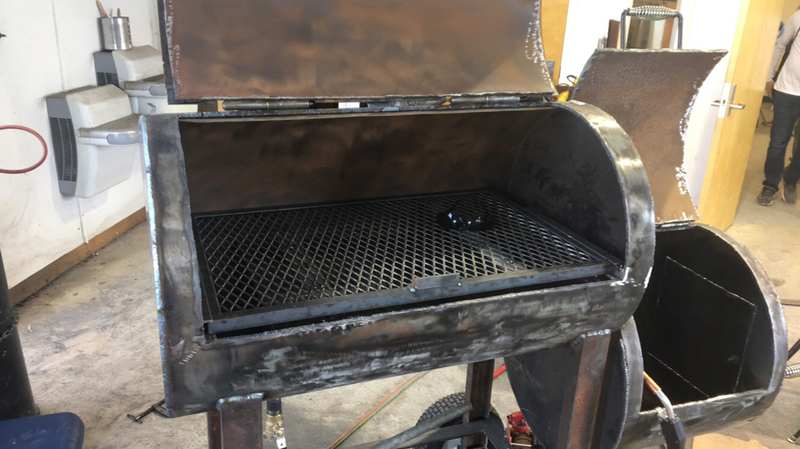 Nothing live about building a smoker. Tips? 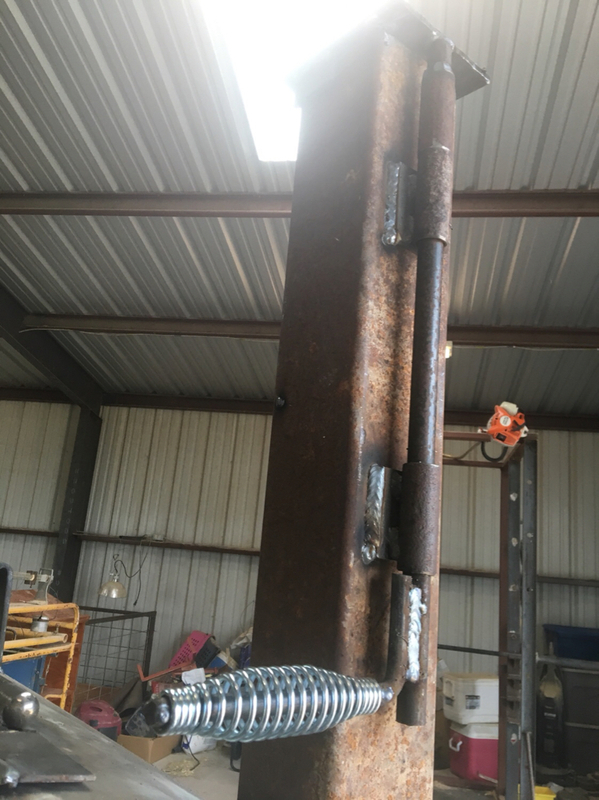 I would say build your own hinges out of cold roll & pipe. 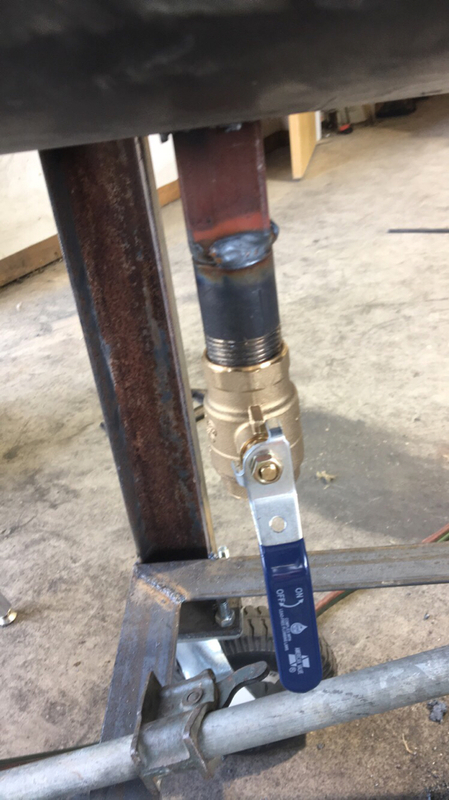 Once you get a few heat cycles, and a little rust sets in, those weld on type hinges bind up. I have had great luck with cold roll. 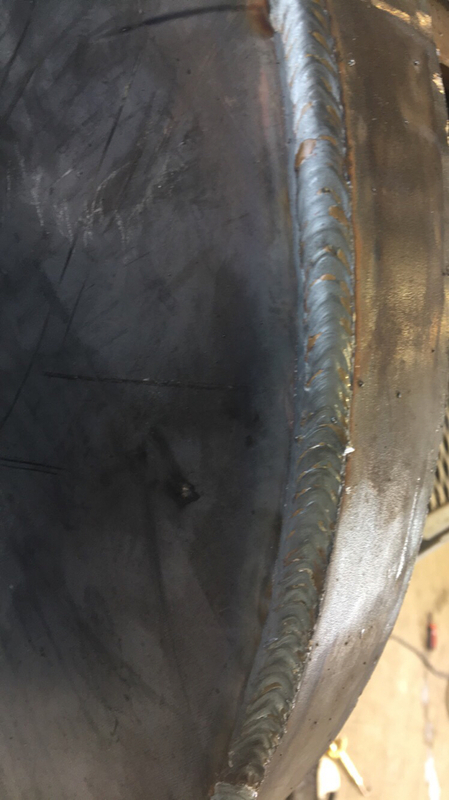 I think its 1/2" rod & 1/2" sch80 seamless. Watch your heat when working on your doors. It don't matter how thick it is, it will still grow. Leave them attached in the corners, and cut that last (after you have let the pit cool back down). If your going to flange out your doors, tack & fit them to the door first. 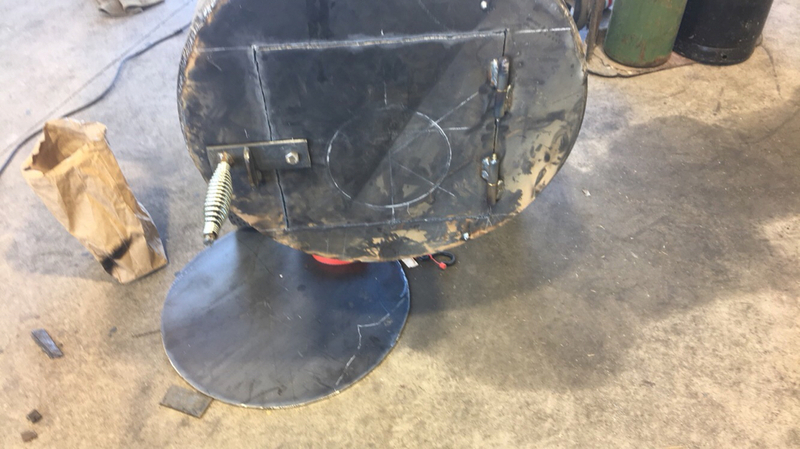 And then tack them to the pit prior to putting any weld on them. 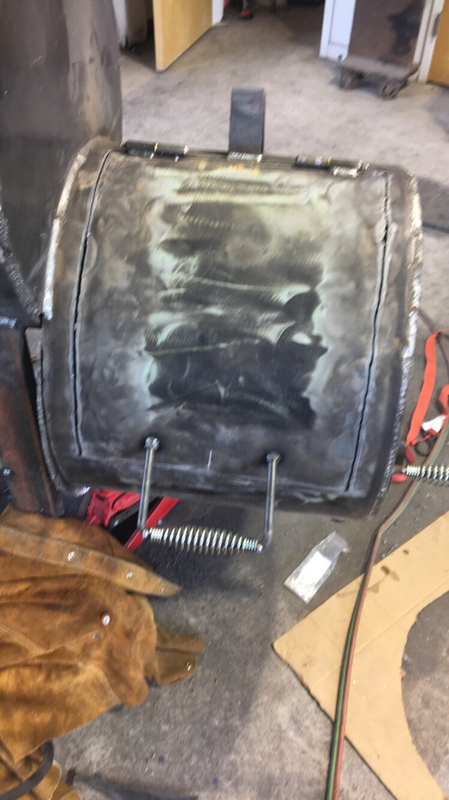 Once your done welding, let everything cool back down prior to cutting the tacks loose. 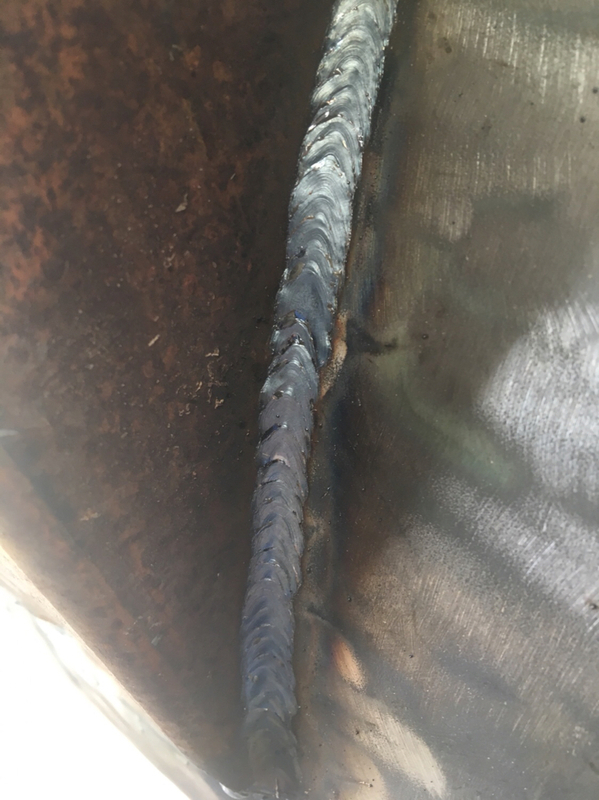 I like to stich weld them, with welds less than 2" long. 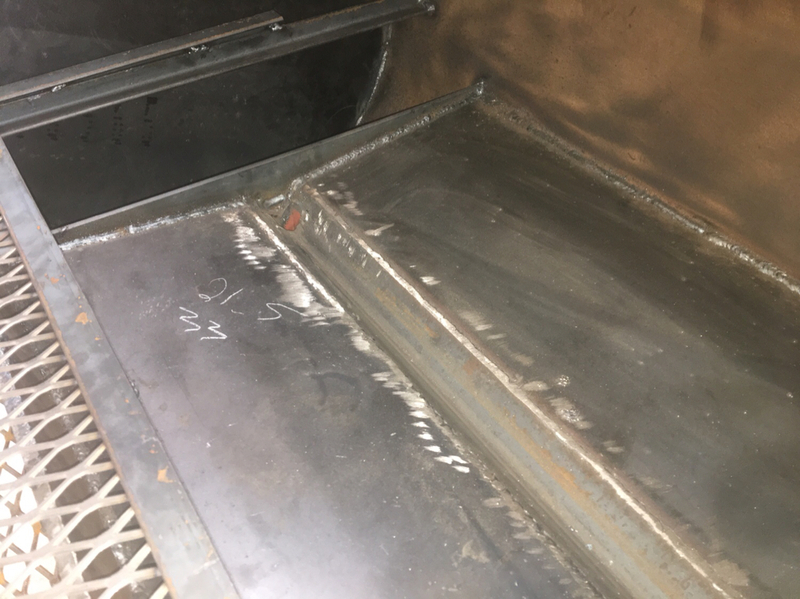 First I mark out where I want my welds so it looks even when I am done. 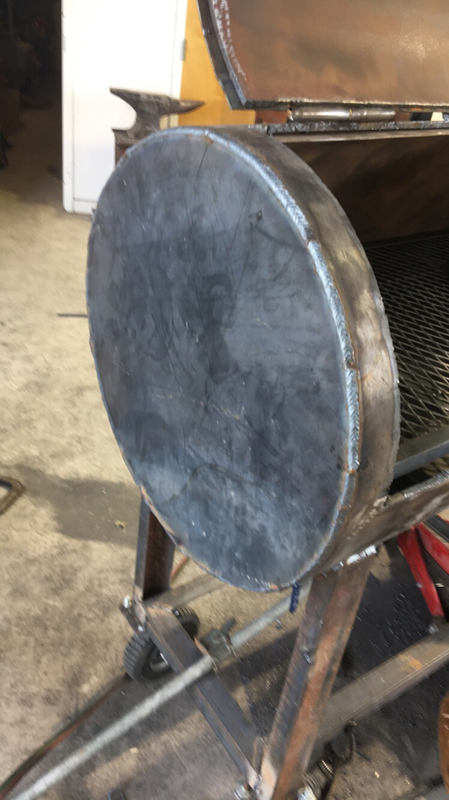 I actually mark the welds before I tack the flanges on so I can just weld over the tacks. 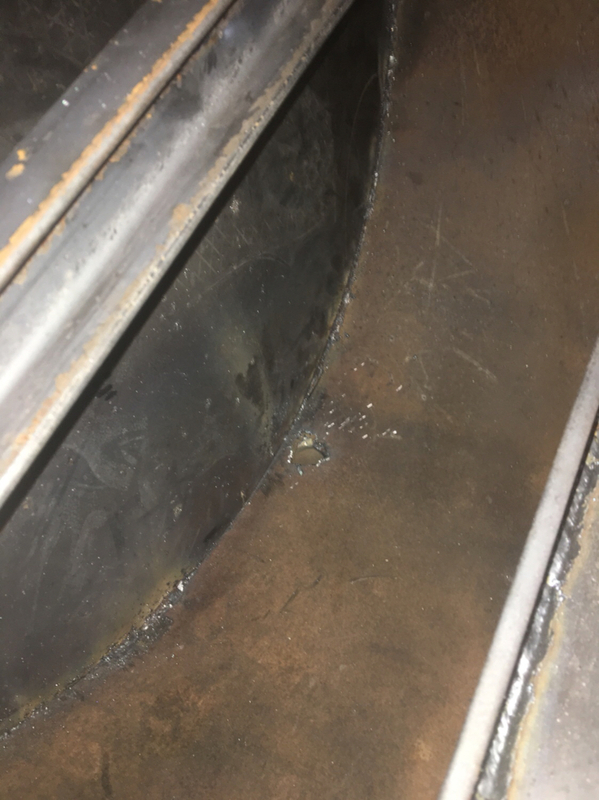 As I finish a stich weld, I move to different spot on the opposite side of the door to help even out the heat, and not concentrate it in one spot. When I am done, I walk away from it for 24 hrs. Come back the next day to cut the tacks loose. I have had pretty good luck with keeping my doors square like this. Last edited by Palmetto; 05-03-2018 at 07:40 AM. 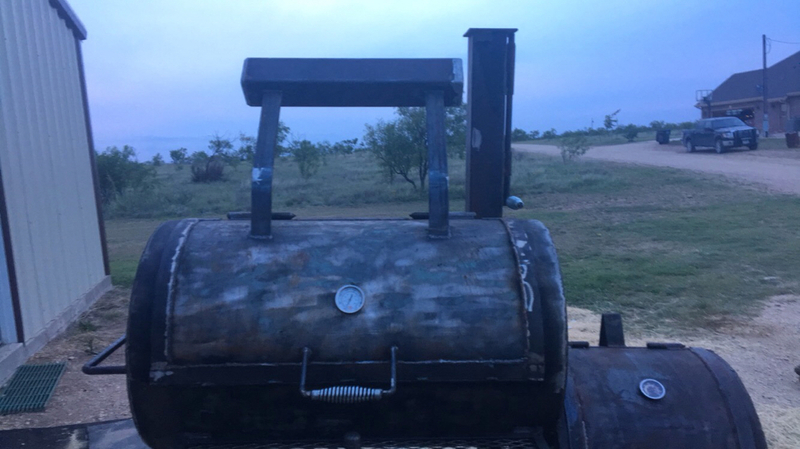 I would make the fire box longer than 20”. 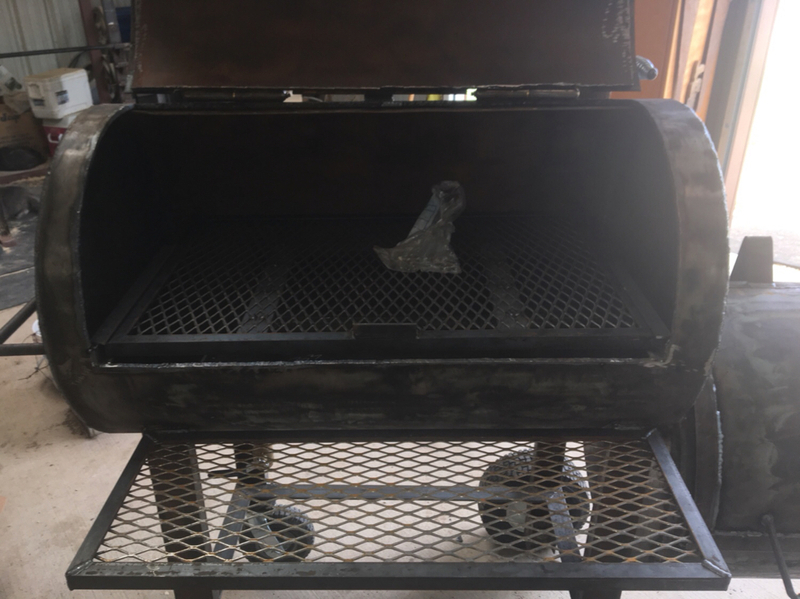 My current smoker has a 22” fire box and I will be redoing it soon because I feel it is too short. 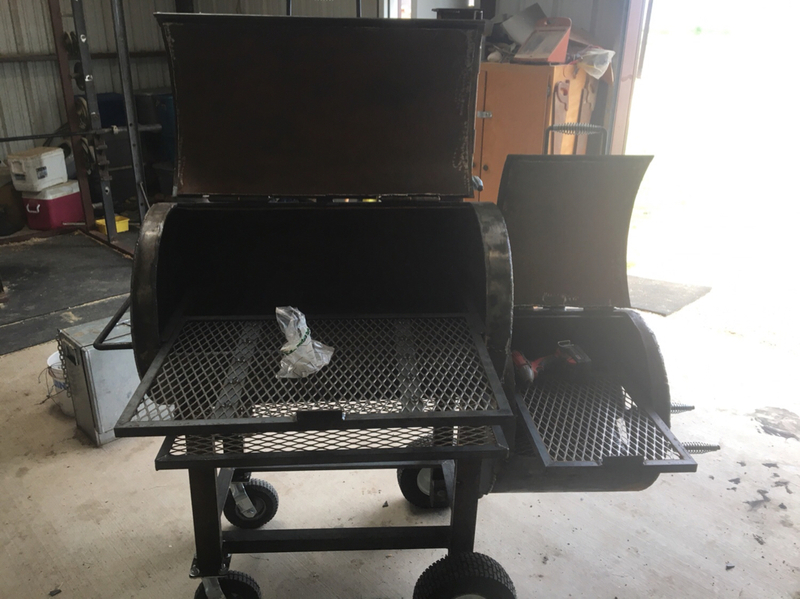 Last smoker I built was for my dad and it has a 30” box which is much more user friendly and will accept just about any log. 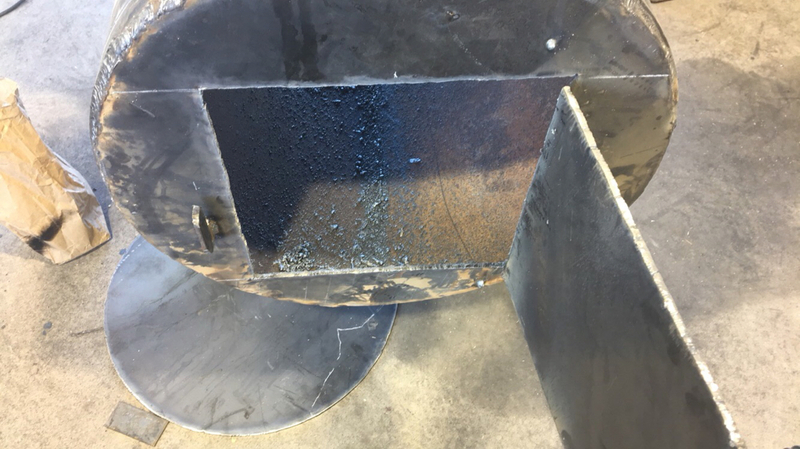 And Palmettos post about cutting the doors and welding the flanges are spot on IMO. I learned the hard way. Once you warp the doors it’s hard to come back from that. Last edited by JWalker08; 05-03-2018 at 10:35 AM. 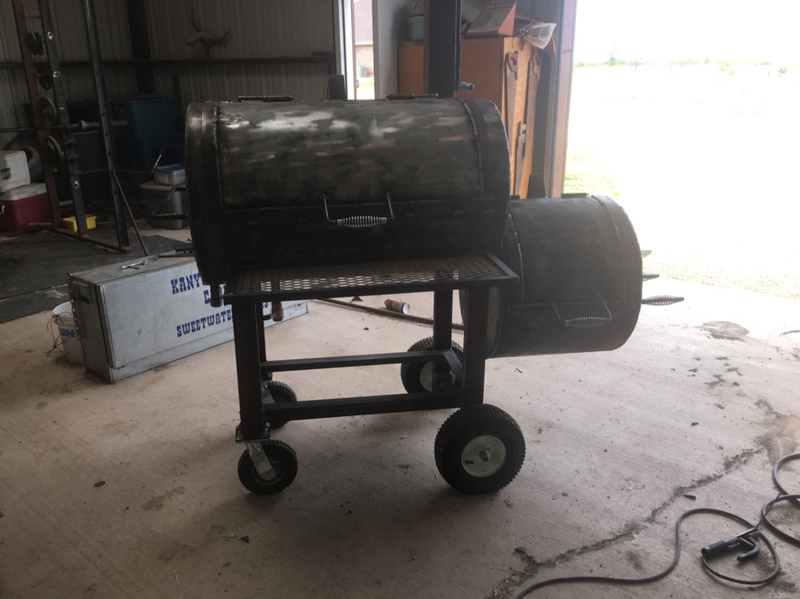 X2 Nothing live about building a smoker. I've been working on mine every weekend for the last 4 weeks. I will finally have it wrapped up this weekend I hope. Lol. That’s why I put the “ish” in the title. Thanks for the tips. I got a little bit done today, but forgot to take pics. 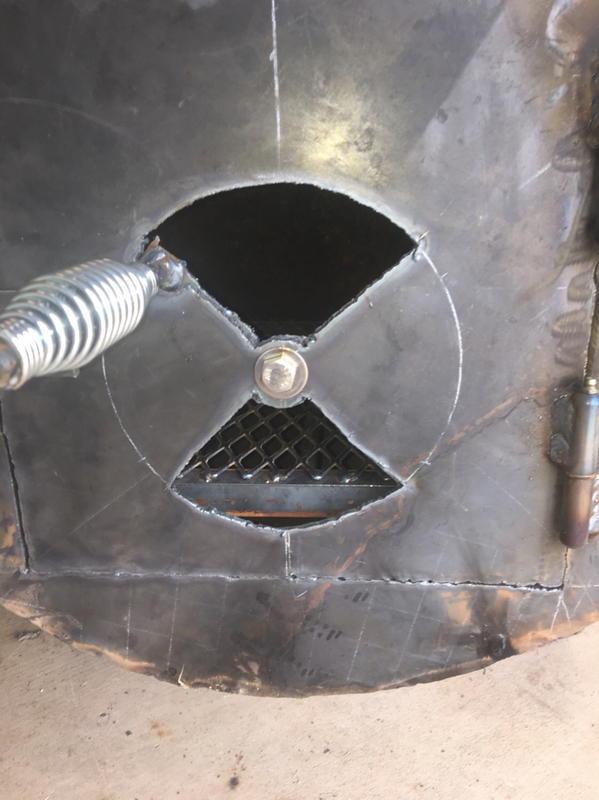 Firebox and Cooking Chamber are cut, reverse flow baffle is cut and tacked in, and I have all the end plates cut with one welded on. All of this cutting makes me want a plasma cutter even more. Last edited by Raider4044; 05-03-2018 at 09:40 PM. Finally remembered to take some pictures. 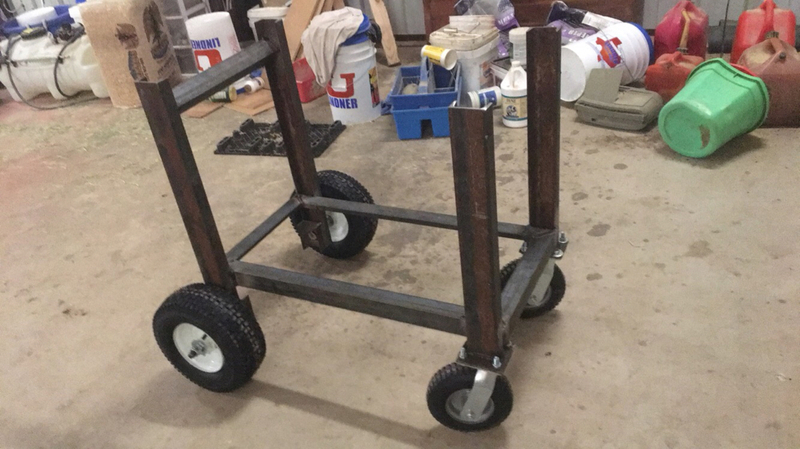 Also got the cart built for it this morning. 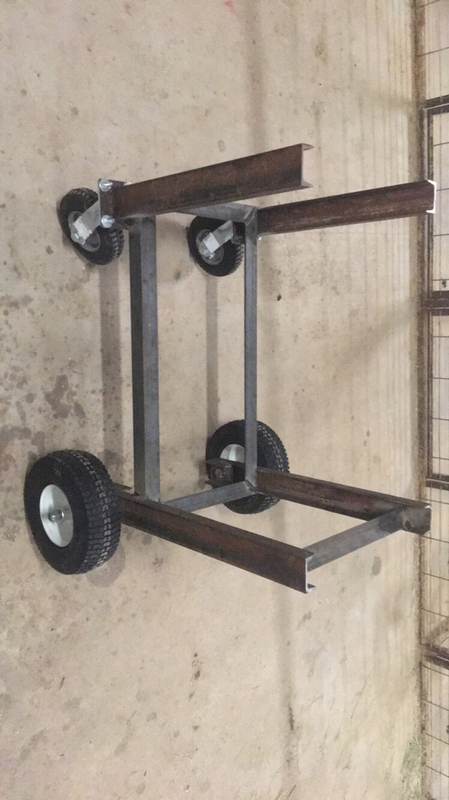 Looks good - only thing I can add is for 1/2” wall your going to need a lot of rods, grinding disks, flapper wheels, and cold beer. Does anyone know a good place to get the spring handles? Can be around Abilene, San Angelo, Midland/Odessa, or Lubbock Area. Or a place online that doesn’t have $20 shipping. I usually just order them on Amazon. Seems like they run about $10 apiece and have free shipping. Lubbock welding supply has them. Next time save your flap disc's. 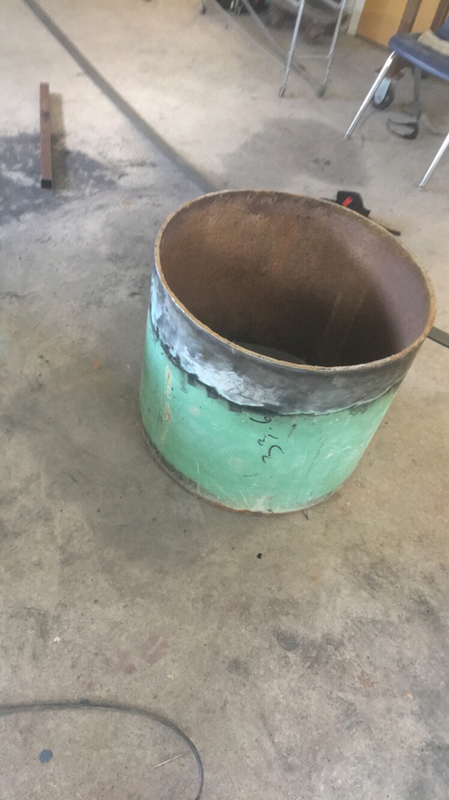 Just roll that pipe out side, stand it up, block it up a few inches off the ground, and build a fire in it. The paint will fall off. Oh....and make sure you stay upwind. 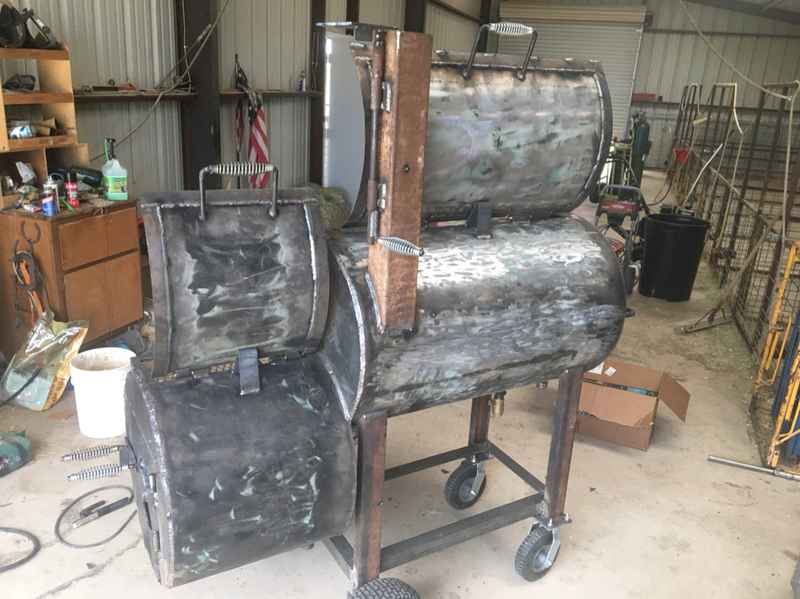 What kind of paint do y’all suggest for a smoker? 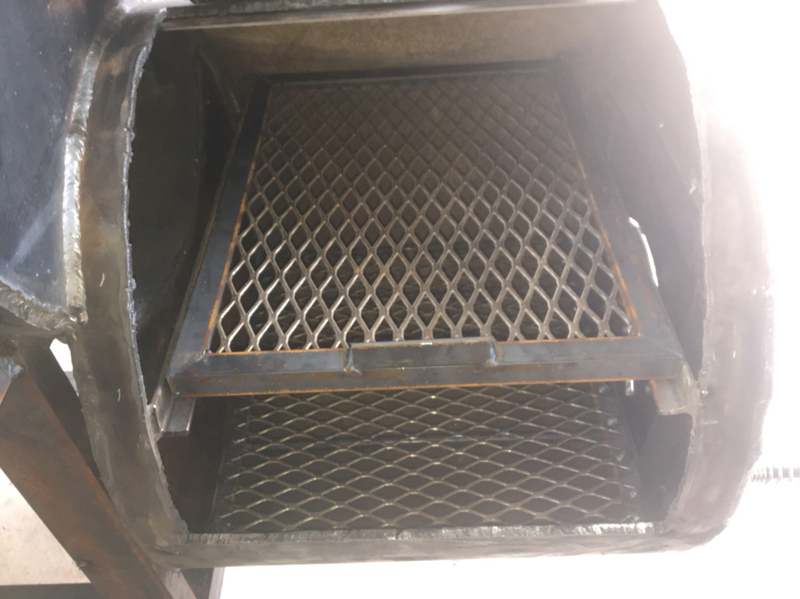 Does the high-temp rattle can last? If not what is a good paint? I do have a spray gun by the way. It’s not cheap but it’s legit. 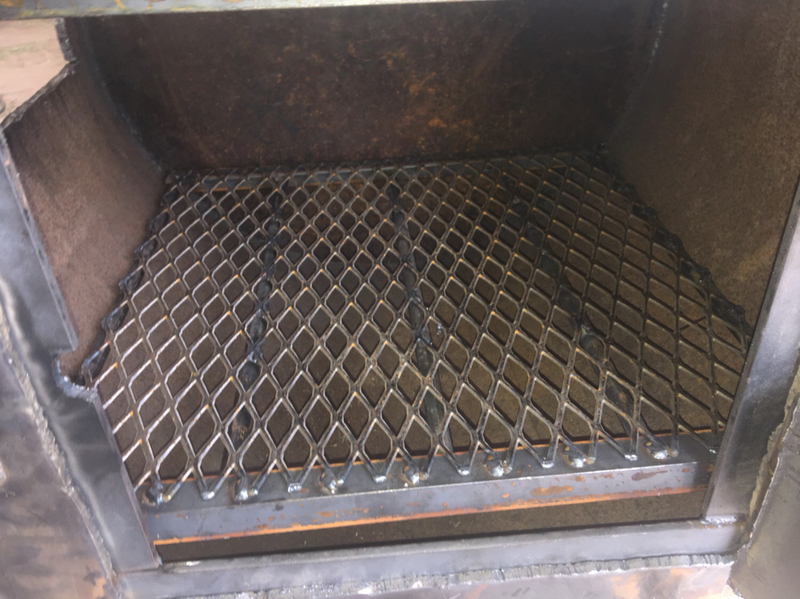 Nice job Raider...very clean welding. I'm always amazed by the redneck ingenuity and talent on the green screen. Thanks guys. Should get a lot more done today. I'm hoping to get it finished up by this weekend minus burning it out and painting. 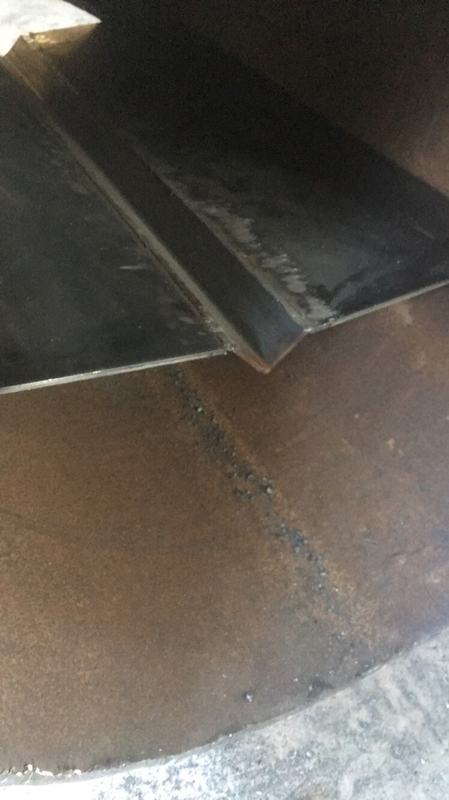 You sir, have some mad welding skills. 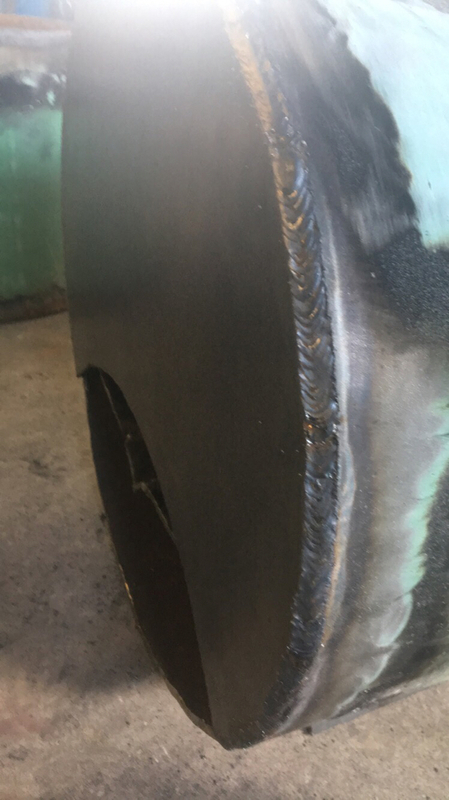 Well, I’m finally done with all of the welding. All I lack is a little bit of grinding, paint and installing thermometers. 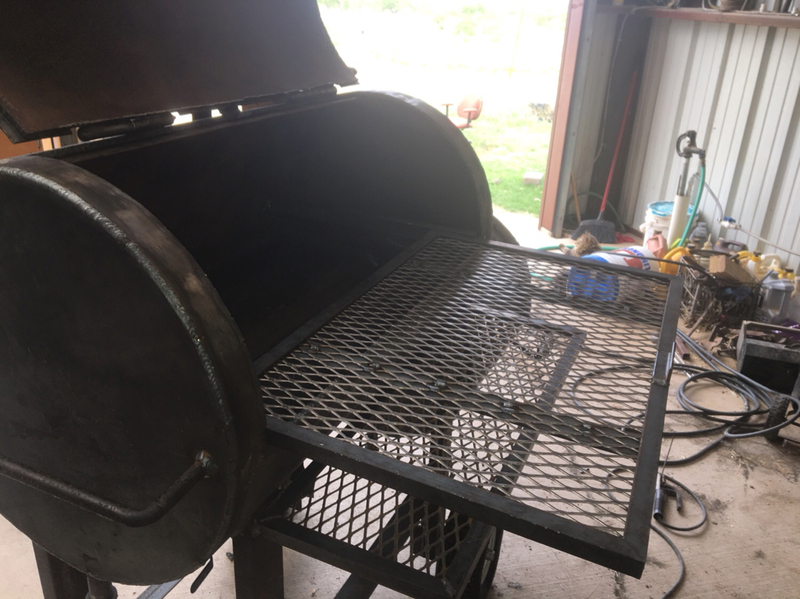 It’s been a fun project, but I’m glad it’s about ready to cook on! Looks good, nice job stacken those nickels. If you get used how do you k ow something nastt hasn't been through it? Last edited by TxKronik; 05-17-2018 at 07:56 PM. I bought the pipe at Snyder Iron and Metal in Snyder. I think I paid $24 a foot and then like $5 for them to cut 5 foot off of a joint. 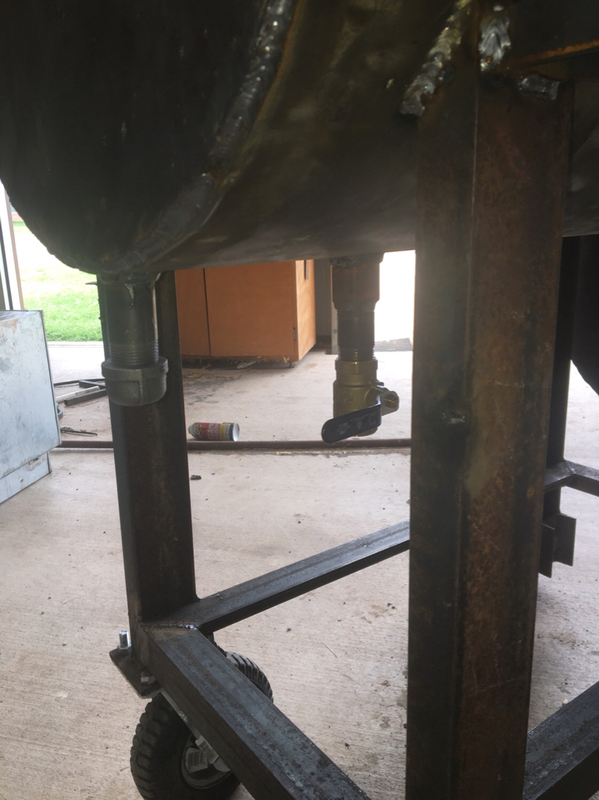 (It helps that there is quite a bit of oilfield work around my area) It wasn't new, but if I had to guess, the pipe I got was extra from a pipeline and never had anything through it. I would just make sure that it isn't nasty on the inside and then just burn it out with a really hot fire. If I were you, I would just call around to all of the scrap yards around your area. Someone is sure to have some pieces in the scrap pile or some joints to cut off. Got everything seasoned yesterday. 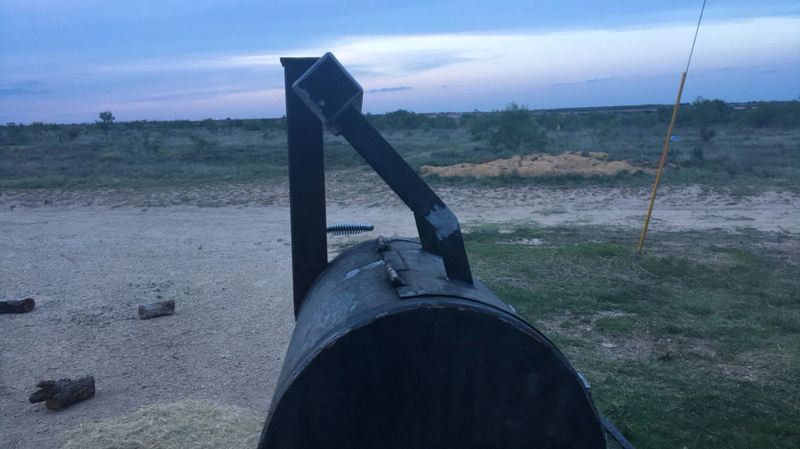 Now I have some ribs and a drunk chicken smoking this afternoon. The door ended up being way heavier than I thought it was, so I ended up putting a counter weight on it.